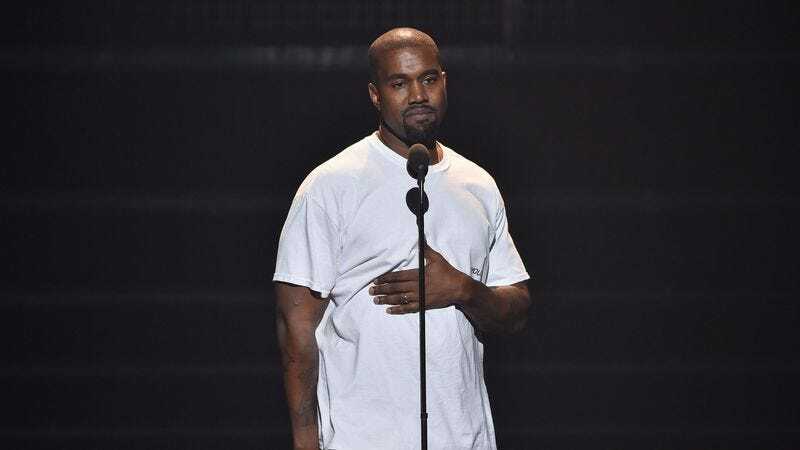 This year, rather than getting all flustered and acting like Kanye West’s latest big stunt wasn’t great for the network in every possible way, MTV simply stepped aside and gave him a few minutes to talk about whatever he wanted. West started off by making a joke about that Taylor Swift thing (again), then he transitioned into a reference to all of the people who have recently been murdered in Chicago, which he then tied back into Taylor Swift and how nice it was of him to call her about the “Famous” video. The whole thing was like a Greatest Hits compilation of the stuff West has been up to lately, just in case people haven’t been following his exploits—though the crowd certainly had, given how many times West was interrupted by people screaming out references to things he did. But all of that was just to set up the real reason West was there, which was to debut his new video for “Fade.” Centered on a woman (Teyana Taylor) dancing around some gym equipment, the video is surprisingly straightforward for 2016 Kanye West, at least until the end when she turns into a cat person surrounded by sheep.